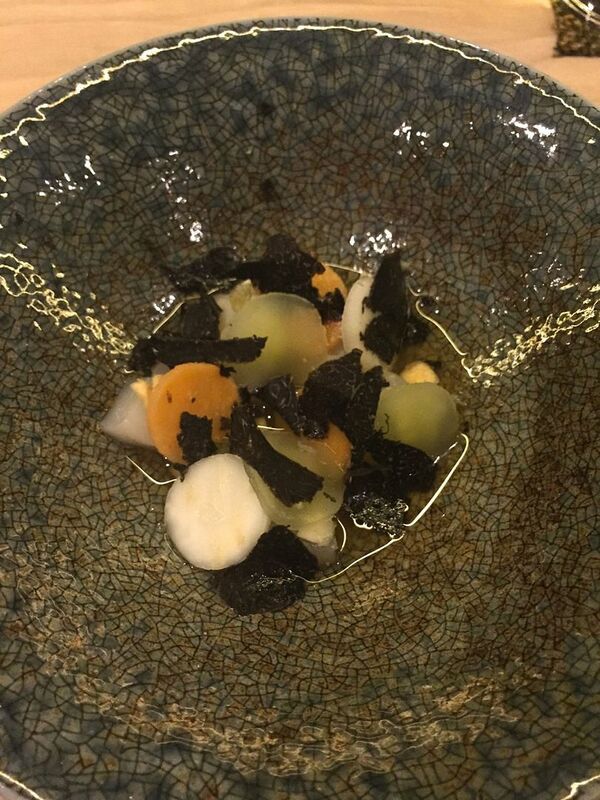 From the Kaiseki chorus: scallops with pickled carrot and celery root, pumpkin seeds and truffle. I never thought I might one day seem grumpy, even ossified, set in my ways. All those decades sipping and devouring and celebrating the new, as New York fell in love with food and dining out…I was a natural athlete leaping up to embrace exotica like tiramisu and mapo tofu and beef cheeks. I pointed the way. Nick Kim works the rice, sometimes transported, but quick to engage in conversation if you wish. But now, I have been demonizing modernist glues and gels, peeling lardo off my sea urchin, decrying lawn cuttings in my desserts and it seems I am not totally convinced that a sushi bar should be fun, rather than a religious ceremony. This is possibly very western of me. Or even midwestern. And that brings this born-again Detroiter to the unique, remarkable, much loved, booked-far-ahead Shuko. There's a lot of action behind the two chefs, including Zach Gross tending to the bar and serious cocktails. 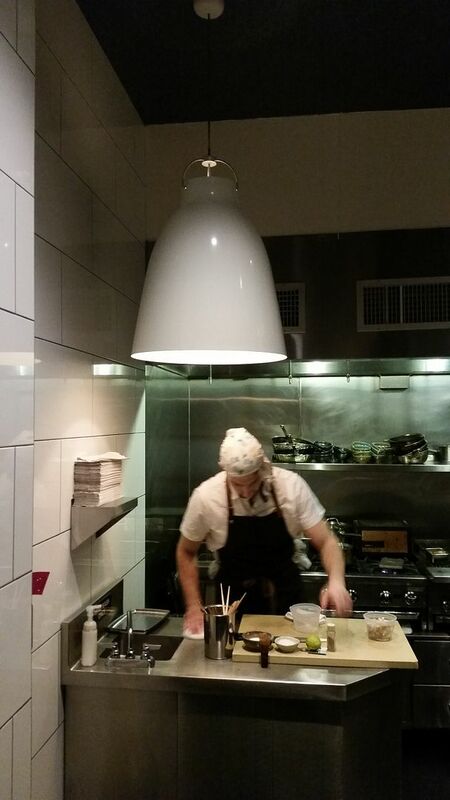 I noticed my first symptom of fuddy-duddyness when the partners at Shuko. Nick Kim and Jimmy Lau, stalwarts behind the idol Masa, first starred together at Neta. I came to that party late with a sushi-devotee friend and we ordered the $95 chef’s choice tasting, quickly succumbing to Santa Barbara sea urchin atop yuba soy milk -- both soft, both slippery. There were many cries and ahas. 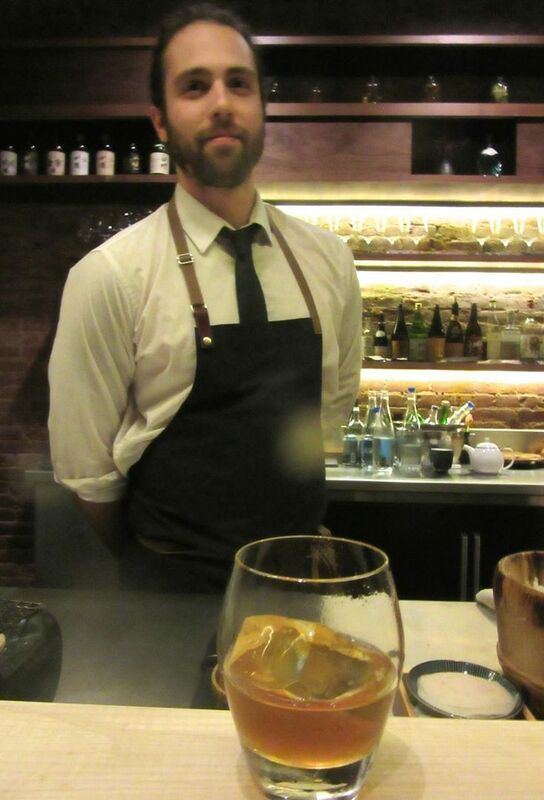 Here he is putting together my cocktail: a 10-year-old Armagnac on the house’s handmade ice. It’s not that I wasn’t excited by the parade that evening, occasionally even wowed. Click here to read my BITE. But I also found myself distracted by the confusion, the jarring traffic criss-crossing in front of us where there was no back room, and everything -- cooking, bartending, dishwashing, sushi sculpting -- taking place on stage with James Brown roaring and Motown blaring. Cooked dishes are prepared by a cook working at a stove off stage under this dramatic fixture. My pal didn’t seem to mind. He became a regular at Neta and remains so, even after Kim and Lau left to create a refuge of their own. He was already established there too, long before my friend Wilfred finally scored a booking online and invited me to join him. I like a tiny bit of wasabi between sushi. Kim grates it fresh from the root on sharkskin. We land at the broad sweep of ash counter, cut from a single tree at the bidding of architect Richard Bloch (designer of Neta as well). I hadn’t dared ask. nor had my pal Wilfred made a request for a prime location, but we find ourselves settled in front of Kim. I’m guessing he remembers me from Neta (or as a fan of designer Bloch). 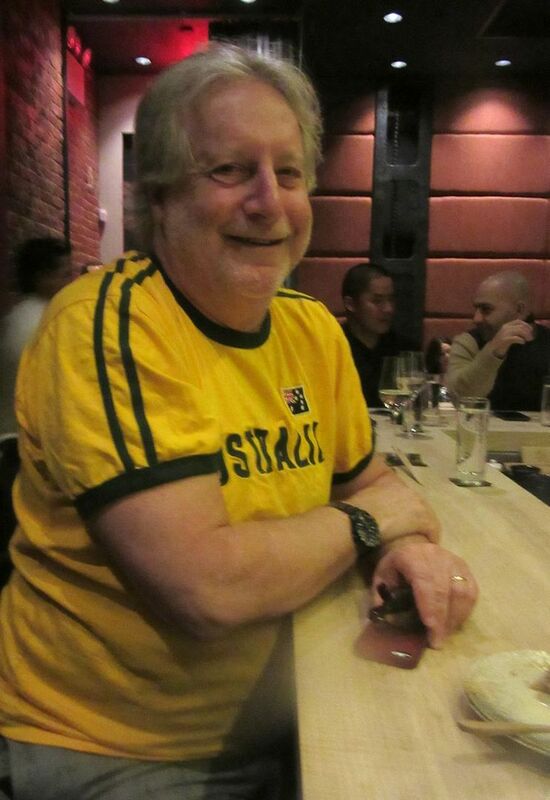 Jonathan Waxman flanked by admirers is exuberant in his exchanges with the Shuko team. 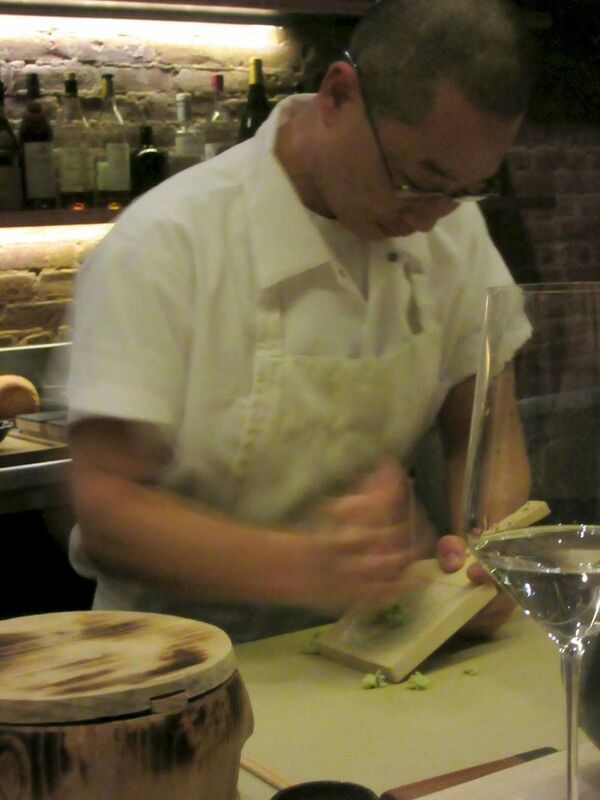 Jonathan Waxman is two seats away, laughing with friends, all of them engaging Shuko partner Jimmy Lau at his work station. In the distance I spot Alessandro Borgognone, an owner of Sushi Nakazawa. Has he come to see what the competition is up to? I wonder if he is recognized. Perhaps there will always be a few seats held open for regulars. One night there are gasps and whispers as Jay-Z and Beyoncé roll in. 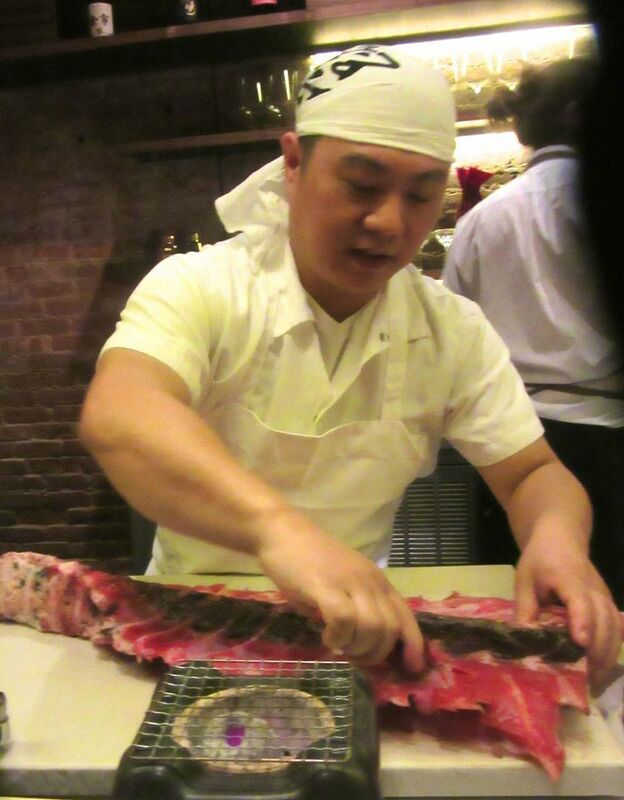 Here’s co-owner Jimmy Lau harvesting velvety tuna from the side of a large tuna carcass. But now we’re in the spotlight. There are only two choices, we’re told: We agree without debate on the $175 Sushi Kaiseki tasting rather than the less expensive Sushi Omakase. (We promise ourselves we will be back to do the $135 sushi tasting soon.) 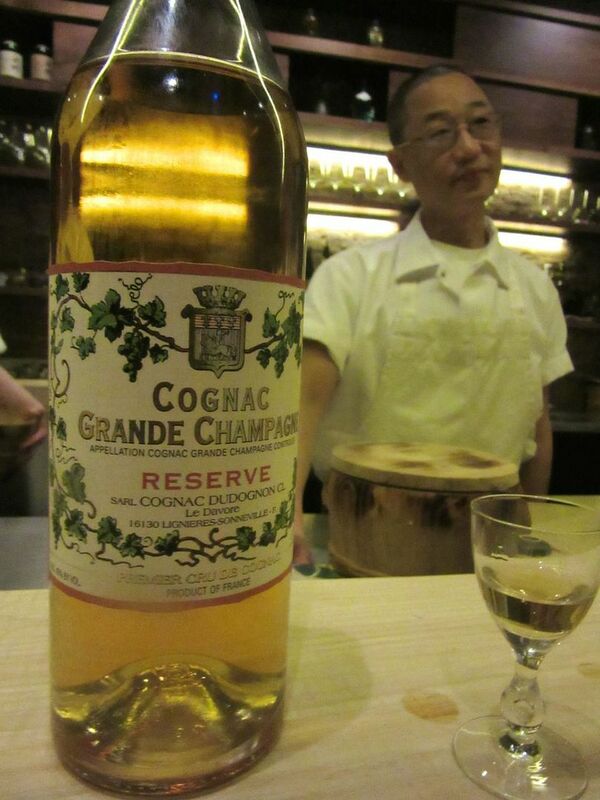 The tall bartender with his hair in a bun pours my red wine and suggests a sake for Wilfred at his request. 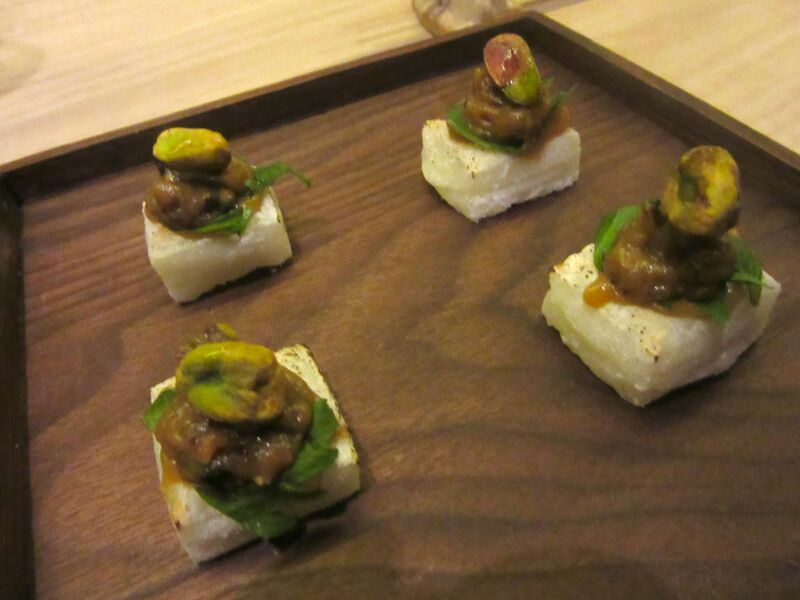 Pistachio mochi on crispy rice cake with a whole nut on top is a playful amuse. The dishwashing is tucked away invisibly here, but it’s still, I notice, all in the family upfront -- runners bringing ingredients, of course, or clearing, but also the bar station and supplies, the manager and staff rotating in and out, chattering. Chrysanthemum petals flutter atop the gingery Dungeness crab salad. But then Kim delivers his mochi amuse. Normally a dessert, the sweet, chewy pistachio-tinted paste on rice with a leaf of shiso and a whole nut on top is the launch, two for each of us. 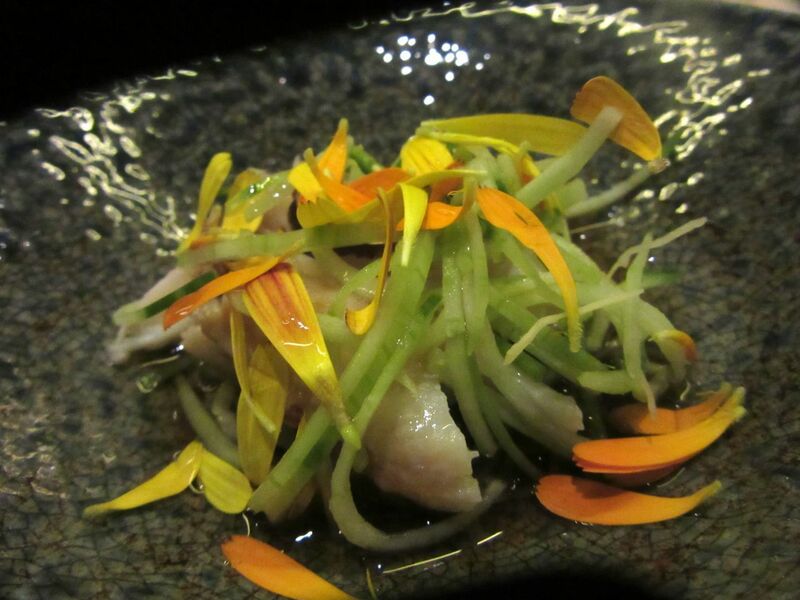 Chrysanthemum petals flutter atop the Dungeness crab salad with ginger that follows. 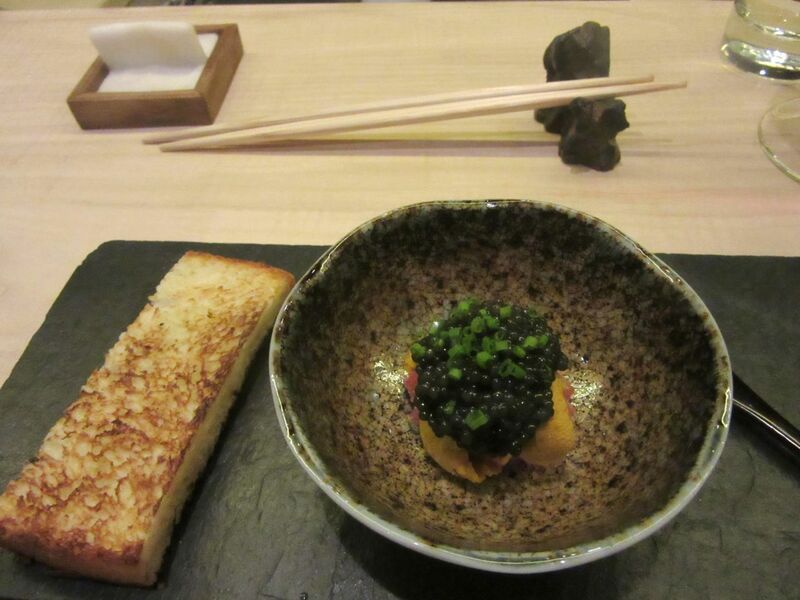 Fattiest tuna topped with uni and then caviar comes with home baked milk bread toast. The perfect rectangle of toasted, homemade milk bread lies alongside an extravagance of pale fatty toro topped with sea urchin, then frosted with caviar. A thick cut of Tasmanian sea trout comes in a bowl with a small wooden spoon to scoop up the soupy mix of trout roe, ponzu and grated raw nagaimo, a tuber, sticky and crunchy. 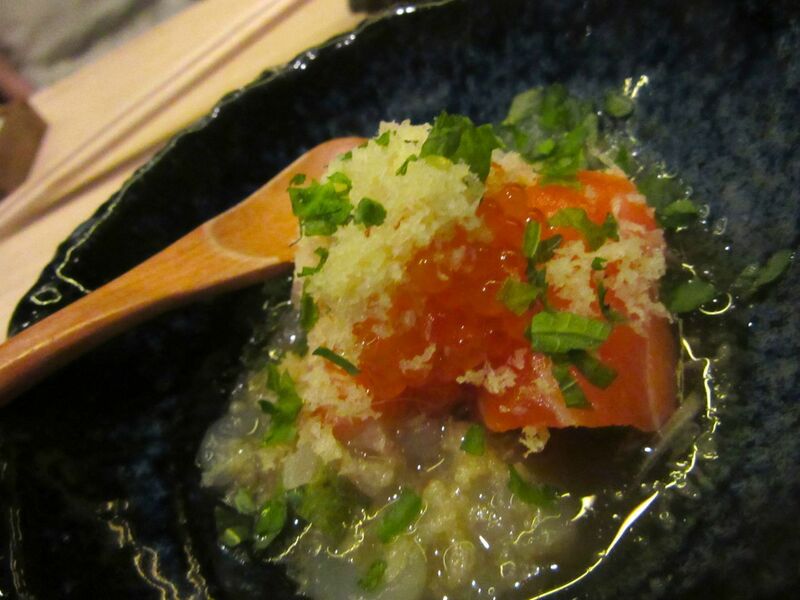 A thick cut of Tasmanian sea trout arrives in a soupy mix of trout roe, ponzu and grated raw nagaimo. “Look, it’s everything but the kitchen sink,” I observe, as robata-grilled lobster appears, tossed with celery, cauliflower, mushrooms, Japanese wild parsley and lardons of smoked bacon in garlic butter with truffle essence. 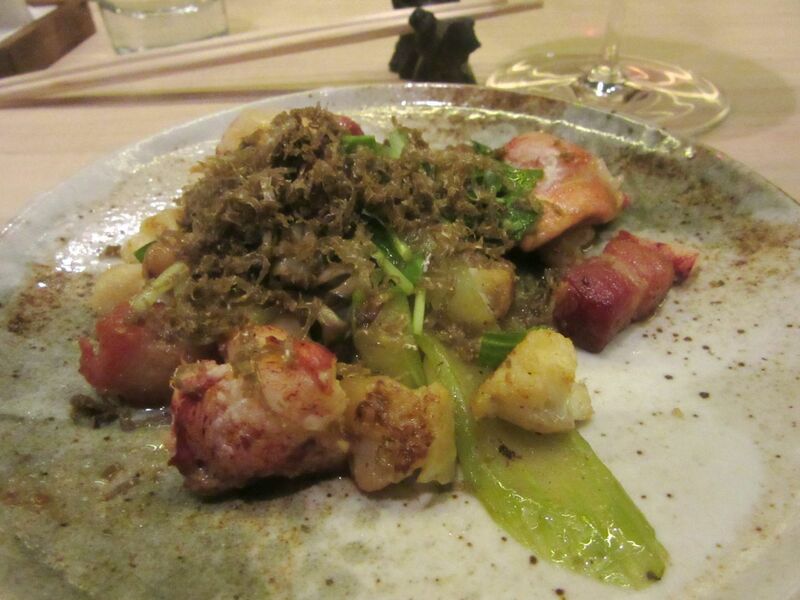 Lobster is tossed with celery, cauliflower, bacon, mushrooms, truffles and mitsuba in garlic butter. Perfect fried kakiage of scallop and root vegetables is the tempura course, preceding a lush stew of fatty veal cheeks with black radish and pickled shallots that seems astonishingly western. When the palate cleanser that follows is an intense dashi broth with one tiny hon shimeji mushroom, it’s clearly a signal that sushi will follow. 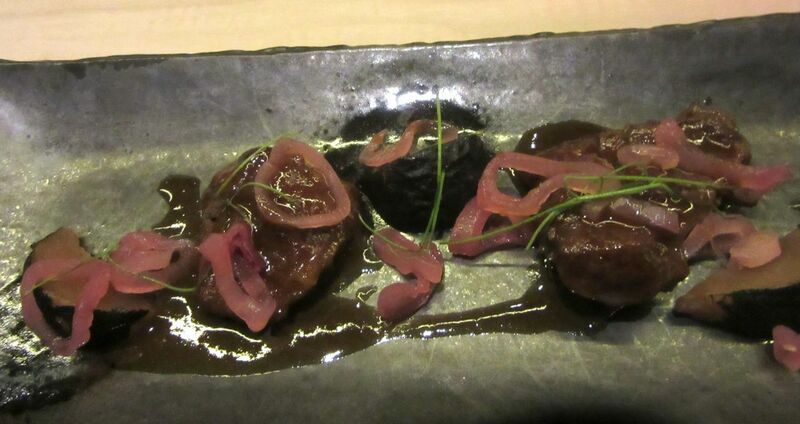 A lush stew of fatty veal cheeks with black radish and pickled shallots seems almost western. Tuna, Spanish mackerel with tempura flakes, skipjack. I love watching the chef’s fist as he reaches into a bowl and takes a clump of warm rice to form the saddle -- tiny, tight but not too -- almost hidden beneath its overhang of cool fish. Kim keeps the wooden bowl under his workspace, replacing the bowl as the rice cools. 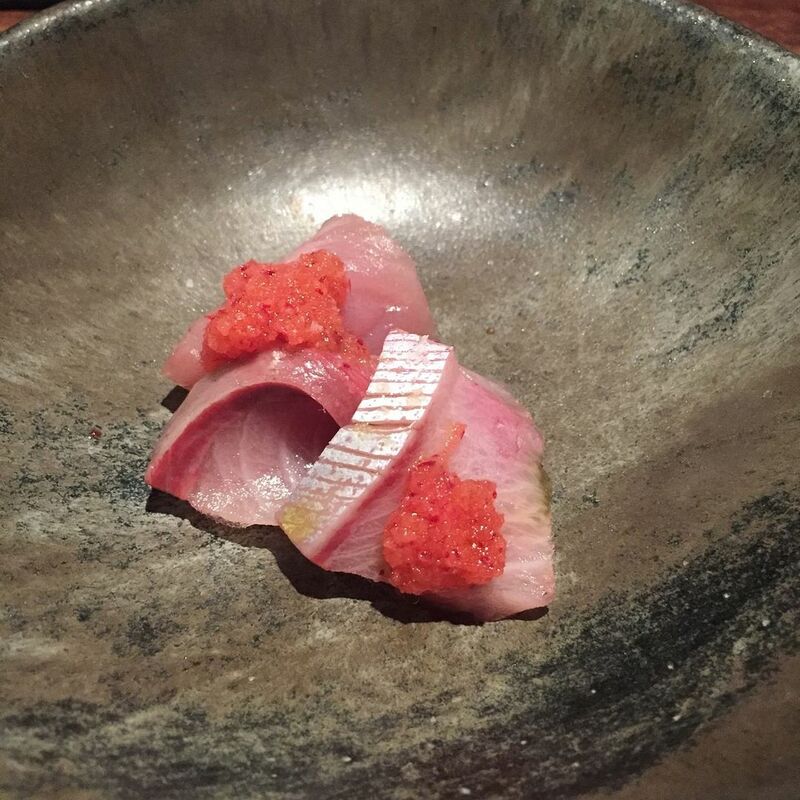 Sometimes the long, perfect sliver of fish is soft, sticky; sometimes it is cold and firm -- between satin and marble -- filling the mouth, almost sweet as it tantalizes the senses. Golden eye snapper with seaweed salt. Dorade wth sea salt and lime zest. 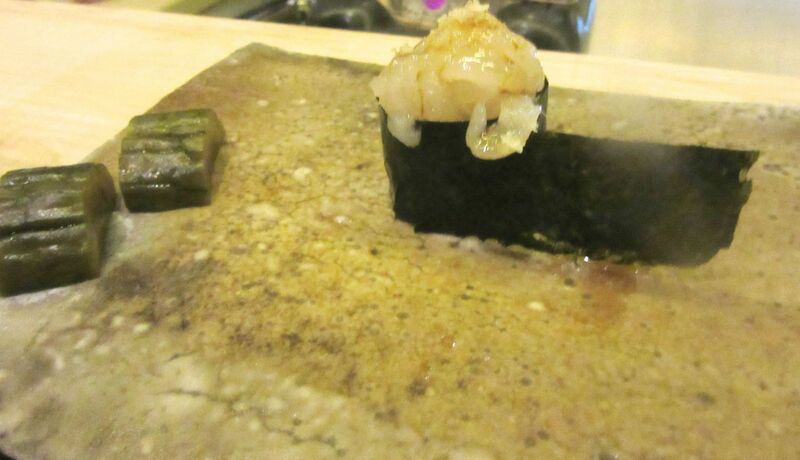 The soft velvet of a scallop with a nori cummerbund. The chefs are caught up in curing pickles. These are optional before sweet raw baby shrimp. The seaweed patch is toasted by passing it atop a simmering chunk of Japanese charcoal in a bowl. 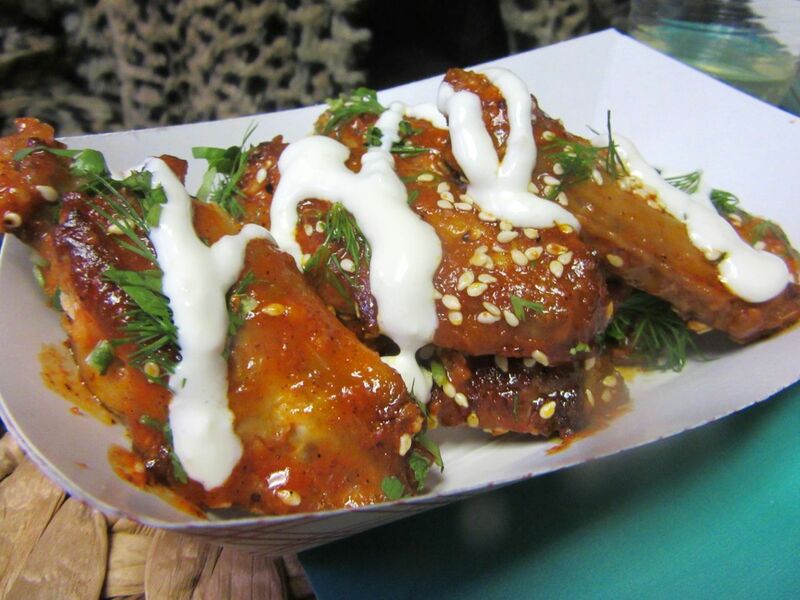 Sometimes Kim puts down a nugget or two of pickle on our plates. House-cured pickles are another infatuation here. Its pungency makes the sticky raw shrimp that follows seem even sweeter. 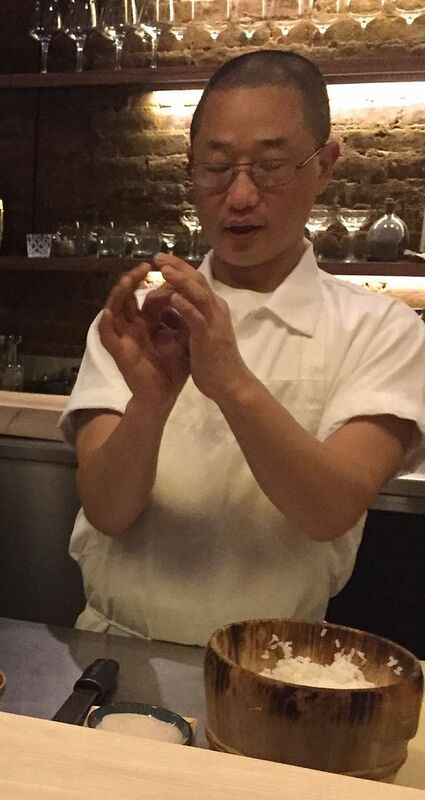 Jimmy Lau works with a batch of sea urchin from Santa Barbara. Lau is cutting rich patches of bright red tuna from between the ribs of a giant carcass. It gets piled in a nori boat. There is tuna sinew shredded in a nori cradle. And stuffed mountain yam. At some point, Kim touches his stomach. “Is it enough?” he asks. 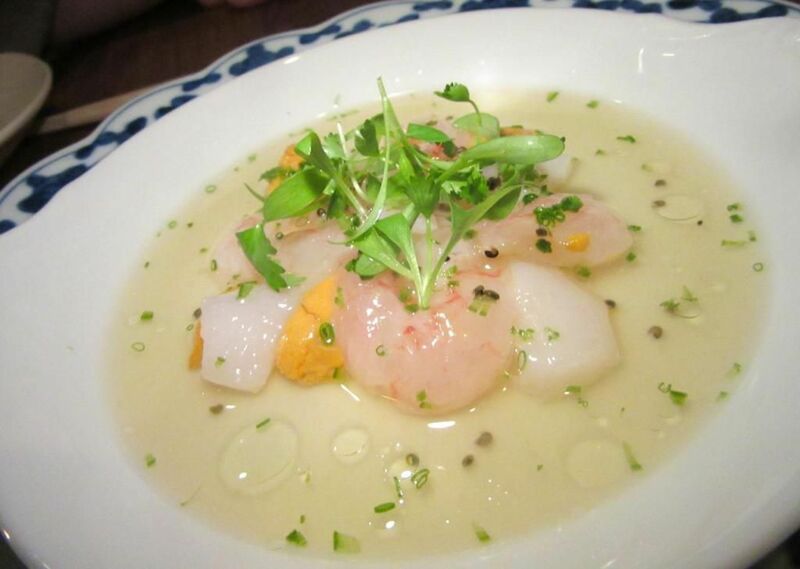 After Santa Barbara sea urchin, there may be uni from Boston, Maine or Japan. Wilfred and I look at each other. Shameless and greedy. “Well, maybe just three or four more?” I suggest. 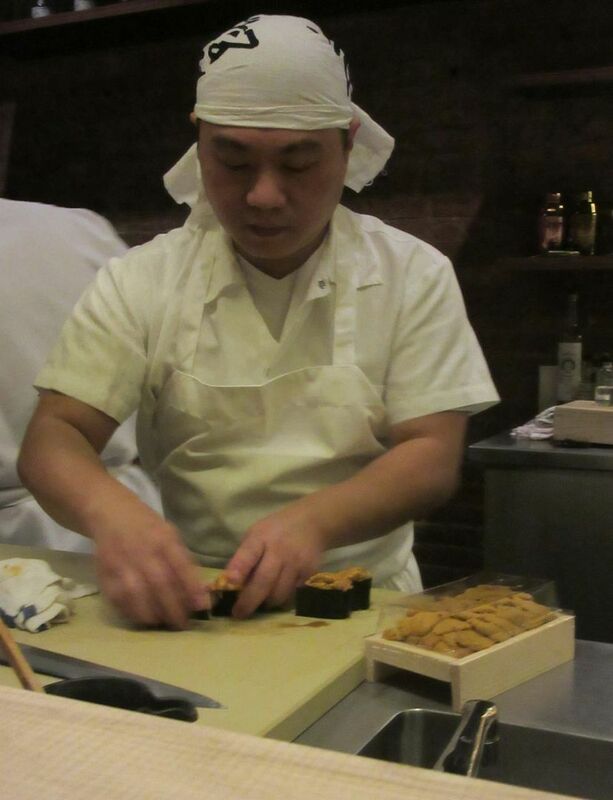 The chef pulls out a package of uni and piles them into a sushi. 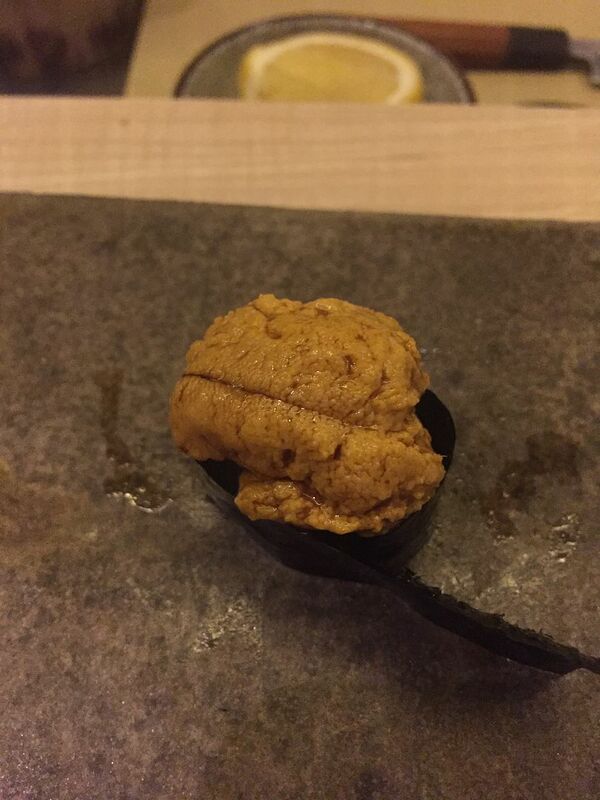 “Oh, uni,” I cry out, drunk on the excess. “Yes, the uni must have heard you,” Kim agrees, fashioning stylish little mini sushi with curling tails of nori. 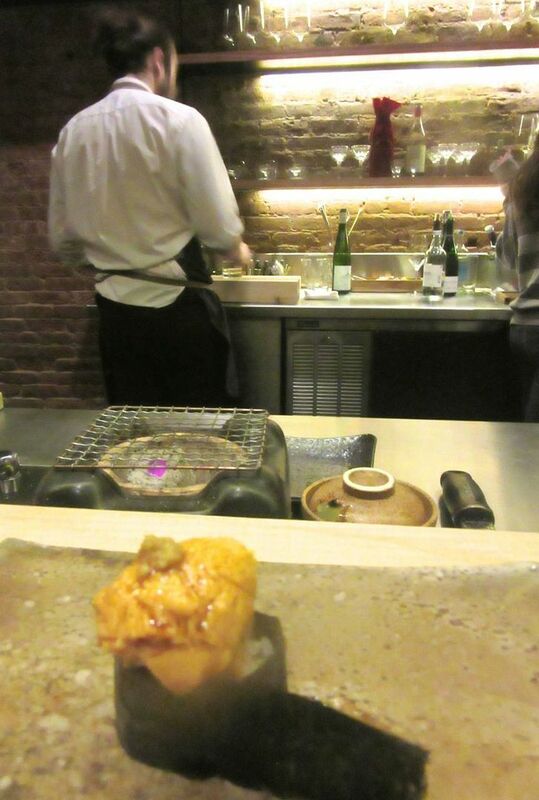 He delivers a maki – sweet-potato tempura – and then another, otoro and then Japanese plum paste. Until we cry out for mercy. It occurs to me that the intimacy of this relationship with Nick Kim is not unlike a session with a new psychiatrist. Kim is pouring his favorite cognac for Wilfred. It’s made from the ugni grape. “A kooky liqueur,” he confides. 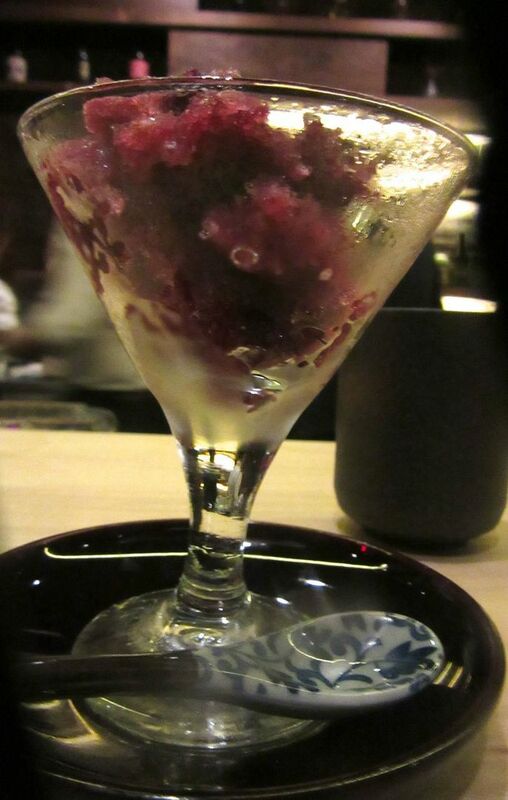 The unique tang of Concornd grape ice makes an excellent palate cleanser before dessert. He was born in California. He was lying around the house of his girlfriend when she said, “Why don’t you go learn how to cook?” He was 16 then and got a job at the small French restaurant where she worked, a mom and pop kind of place. He worked with Christophe Bellanca at l’Orangerie before it closed to become Nobu. 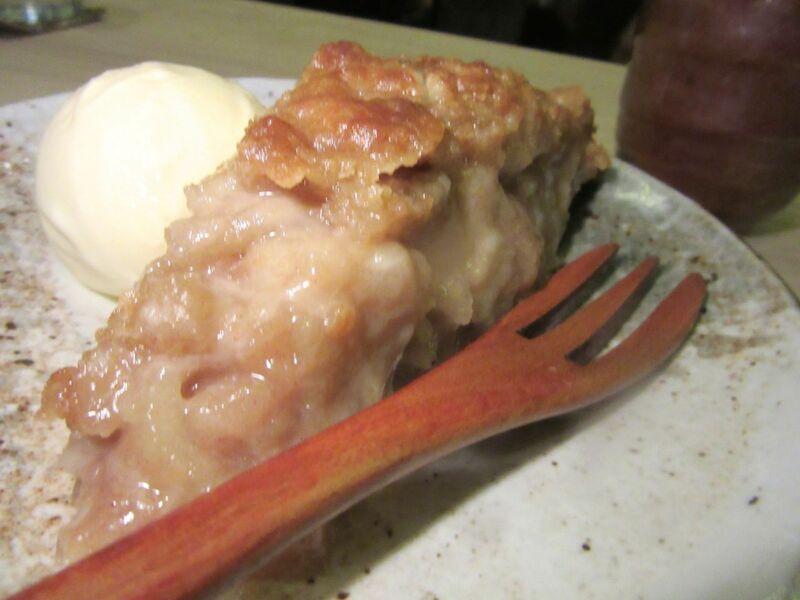 Kim gets a kick out of surprising guests with housemade apple pie topped with bay leaf ice cream. A waiter brings a goblet of shaved Concord grape ice for each of us. Of course, we know what comes next. And then with a giggle from Nick, the infamous apple pie arrives, a melting globe of bay leaf ice cream on top. Nick developed the pie for his nephew during the summer when Shuko was a pop-up in the Hamptons. He adds miso to a blend that is not quite puff pastry and not quite pâte brisée but quite delicious. The apples are baked whole, then spiced and sautéed. That makes them soft and a little soggy. But how petty to be critical, when the truth is how happy both of us are that it isn’t green tea ice cream. 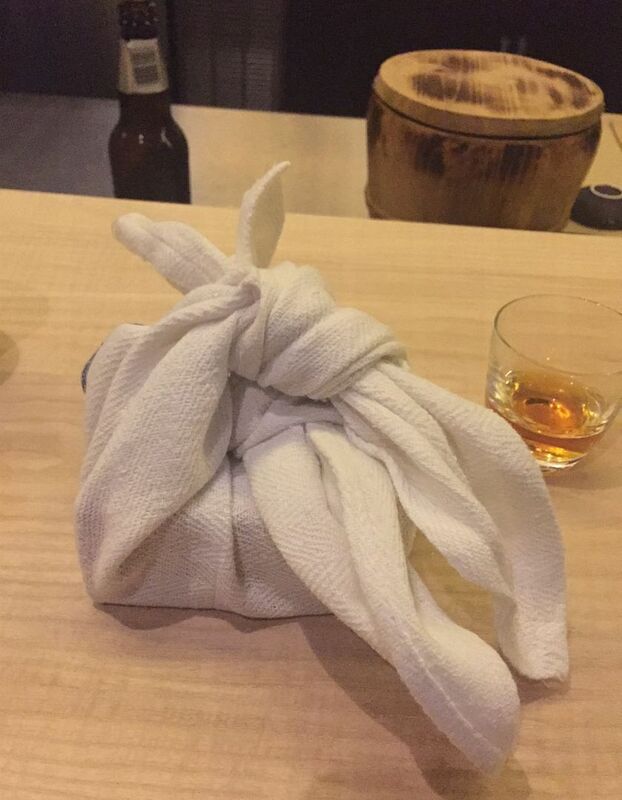 Nick’s milk bread gift in a towel wrap was touching. On my next visit, he gave one to Wilfred too. As I step out into the street, Kim is standing there to say goodnight. He has a gift in his hand, beautifully wrapped in a dish towel. It’s a big chunk of the milk bread. “For your breakfast,” he says.